Long is the life in the White Lotus Hell. The length of life in the White Lotus Hell is not easy to reckon in terms of years, or hundreds of years, or thousands of years or tens of thousands of hundreds of years; so long is the life in the White Lotus Hell. But then, of course, some beggar pipes up and asks: But can an approximation be given? One term in the Nirabbuda is equal to twenty in the Abbuda. One term in the Ababa is equal to twenty in the Nirabbuda. One term in the Aṭaṭa is equal to twenty in the Ababa. One term in the Ahaha is equal to twenty in the Aṭaṭa. One term in Water-Lily Hell is equal to twenty in Ahaha. One term in Sogandihika is equal to twenty in Water-Lily Hell. One term in Blue Lotus Hell is equal to twenty in Sogandihika Hell. One term in Red Lotus Hell is equal to twenty in Blue Lotus Hell. One term in White Lotus Hell is equal to twenty in Red Lotus Hell. PED: nis + aya of i = to go asunder, to go to destrucion, to die, cp. in meaning Vedic nir.rti. The popular etym. Given by Dhammapala at PvA 53 is "n'atthi ettha ayo sukham ti" = there is no good; that given by Bdhgh at Vism 427 "n'atthi ettha assādasaññito ayo" (no refreshment)] purgatory, hell, a place of punishment and torture, where sin is atoned (i.e. kamma ripens = paccati, is literally boiled) by terrible ordeals (kāraṇāni) similar to and partly identical with those of Hades and Tartarus. There are a great number of hells, of which the most fearful is the Avīci-mahāniraya. Names of other purgatories occur frequently in the Jaataka collection ... Kākola; khuradhāra; Dhuuma-roruva; Patāpana; Paduma; Roruva; Sanghāta; Sañjīva; Sataporisa; Sattisūla. [SN 1 6 10] PTS, Outline/Analysis of Mrs. Rhys Davids, trans., The Book of the Kindred Sayings, Part I, The Brahma Suttas, #10 The Kokaalikan (2), pp188. According to the Comy., the Kosalan measures, from a pattha upwards, were four times the bulk of those used in Magadha: 'Twenty khaari's = 1 khaarika, or cartload of tila-seeds [sesame]. How many years does that make? @ 1 per Century: 10,395,902,500 years In Abbuda Niraya. X20	= 207,918,050,000 years in Nirabbuda Niraya. X20	= 4,158,361,000,000 years in Ababa Niraya. X20	= 83,167,220,000,000 years in Aṭaṭa Niraya. X20	= 1,663,344,400,000,000 years in Ababa Niraya. X20	= 33,266,888,000,000,000 years in Ahaha Niraya. X20	= 665,337,760,000,000,000 years in Water-lily Niraya. X20	= 13,306,755,200,000,000,000 years in Sogandhika Niraya. X20	= 266,135,104,000,000,000,000 years in Blue Lotus Niraya. X20	= 5,322,702,080,000,000,000,000 years in Red Lotus Niraya. X20	= 106,454,041,600,000,000,000,000 years in White Lotus Niraya. Rounding off to the nearest sesame seed ... but you really want to be careful counting that teaspoon of sesame seeds ... two stuck together counting as one could add an unexpected 372,172,800,000,000,000 years to this sentence. 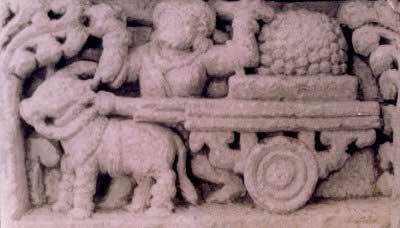 By the way, the significance of the Khari being 1/20th the size of the Kharika should not be lost: as well as fitting in with the scheme of "Times 20", the Khari is also known as "A load," specifically the load of requisites carried by the ascetic. These names do not represent separate hells, but only periods of time in Avichi — the general term for the informal regions; cf. Bud. Psy. Eth., p. 334; apportioned to each entrant by the automatic working of Karma. — well that seems like nitpicking to me, anyone finding themselves residing in one single place for approximately 40 aeons, or 4/5ths of Ñ of 1/4th of a complete 4 cycled world cycle (evolution, rest, devolution, rest, of the world), or Kappa — one Magadha'n cartload's worth of sesame seeds removed at the same rate of one per century also being approximately the duration of an aeon — would hardly quibble over whether it was a division of a Greater Hell or a Hell unto itself (except, of course, when it came time to depart where one then discovers that this was only the first of several stages of "evolution" out of the hell-hole one was in).